As a Consultant Tax, Accounting & Strategy you are involved in all the work concerning tax compliance and fiscal figures. You will work on a tax puzzle. Our clients live in a world where they are confronted with increasingly complex laws and regulations, governments that demand complete transparency and stakeholders who become more actively involved in the strategic tax choices of a company. Due to these developments, has the importance of compliance never been so big. Your role as a Consultant is to help our clients at (inter) national level to comply with their fiscal compliance. Are you an ambitious and driven starter and do you want a position in a stimulating environment with many development opportunities? Then we will gladly lead you to a versatile Tax, Accounting & Strategy advisor. As a Consultant Tax, Accounting & Strategy you are involved in all the work concerning tax compliance and fiscal figures. You will work on a tax puzzle. You work on alternating assignments for various (inter) national clients. You keep yourself busy (in a project-based manner) with, Tax Accounting (among other things Audit of Tax), take part in the testing of technological innovations to improve work processes and draw up declarations (Vpb). Furthermore, you give customers advice on how they can be 'in control', both fiscally and financially, and examine how changing laws and regulations generate both opportunities and risks. It is responsible work, because you like help the customer with compliance reporting. You are the point of contact for your customers, you will visit customers on a regular basis, give advice and regularly switch with the tax authorities. As a consultant, you work intensively with different colleagues within the team. At the Tax, Reporting & Strategy department, colleagues with various study backgrounds work together on Compliance-related assignments. Because you also work closely with colleagues from the Assurance, Tax and Advisory practice, you also get extensive knowledge of other fields. This makes you a sparring partner between the customer and colleagues from other disciplines.In the beginning we will teach you the general activities of Tax Compliance. This remains a part of your work, but you can also invest in your future from the first moment and choose one of the following specializations. Whatever specialization you choose, you will notice that no day is the same. Moreover, within your specialism you still regularly come into contact with other facets of the field. As a Tax Accounting specialist, you operate on the surface of tax and accounting and you know everything about the processing of income taxes in the financial statements of Dutch and foreign multinationals. You are responsible for Tax Accounting and Audit or Tax work for a broad portfolio of clients. You will use your knowledge to various consultancy assignments and as a specialist you support the audit teams in the financial audit of the tax position during the annual audit. You use the concurrence between accountancy standards (IFRS, US GAAP, Dutch GAAP) and tax legislation. You help organizations to keep everything under control from a tax perspective. You do this with advice on the structure of the tax function, the Tax Control Framework and Horizontal Supervision. For example, the functioning of the tax function can be assessed by performing a sample, by applying data analysis or by formulating key controls. By working closely with both tax authorities and customers, you determine which control method fits best and will lead to the best result. You help organizations, from a tax perspective, to keep everything under control. You do this with advice on the structure of the tax function, the Tax Control Framework and Horizontal Supervision. For example, the functioning of the tax function can be assessed by performing a sample, by applying data analysis or by formulating key controls. By working closely together with both tax authorities and customers, you determine which control method fits best and will lead to the best result. You are innovative, enterprising and not afraid from challenging the status quo. 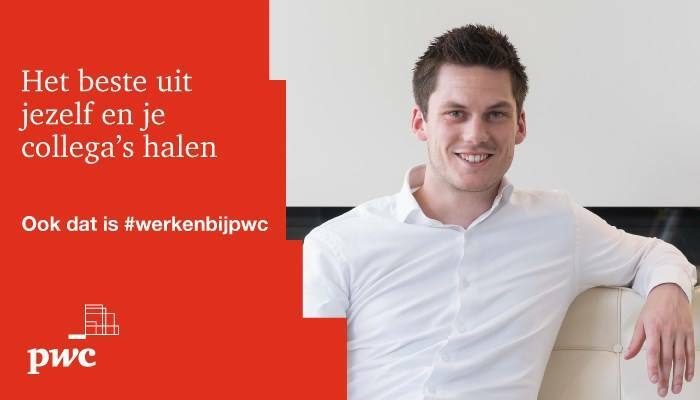 Please send your application for Consultant Tax Accounting en Strategy at PwC in Amsterdam, Rotterdam or Utrecht including your CV via our website.